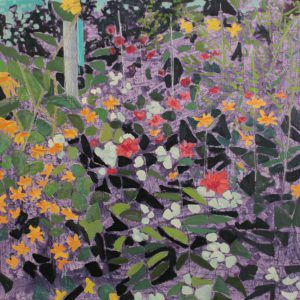 Since Kim Atlin graduated from the Ontario College of Art in Toronto in 1988, her work has been widely collected in Canada and internationally. Her paintings are held in the Ontario Government Collection, the OCAD Printmaking Collection, the Ontario Archives and the National Archives as well as in numerous private and corporate collections throughout Canada, the United States, the United Kingdom, France, Chile, Iceland, and New Zealand. Kim’s latest body of work explores the beauty of natural gardens against urban backdrops. Places she has observed and that inspire her.